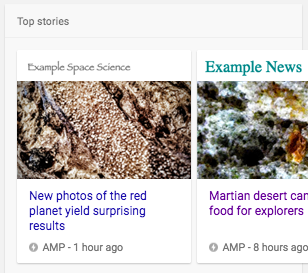 AMP with structured data: [Recommended] AMP pages with structured data can appear in the Top stories carousel, host carousel of rich results, Visual stories, and rich results in mobile Search results. These results can include images, page logos, and other interesting search result features. 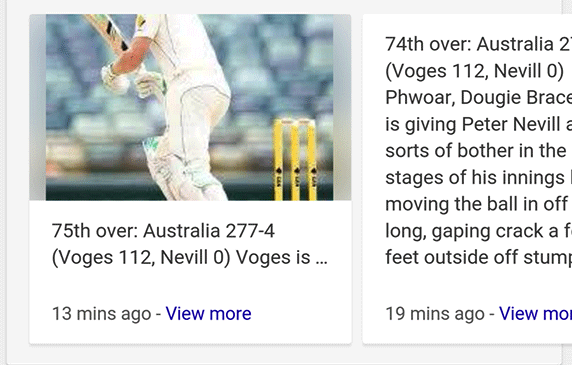 Non-AMP web page with structured data: Non-AMP article pages that include structured data can increase the likelihood of appearing in search results with rich result features. By structuring your content according to this guide, your content may be automatically turned into an action on the Google Assistant. You can learn more about Content Actions on the Actions on Google docs. Here's an example of JSON-LD code for an Article object. Here's an example of JSON-LD code for a Video object. AMP pages that have structured data can appear in a carousel of stories in search results. Without structured data, AMP pages may only appear as standard blue links in Google Search results. For more information about AMP in search results, see About AMP on Google Search. Follow the AMP Project specifications. Follow the additional page guidelines to ensure that Google can crawl your page. 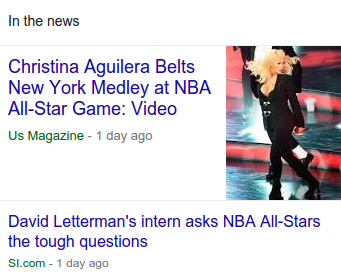 Add a structured data element describing the article or video on the page. If you have duplicate pages for the same content, we recommend placing the same structured data on all page duplicates, not just on the canonical page. For more information on placement, see the Structured Data General Guidelines. Test your structured data using the Structured Data Testing Tool. Non-AMP pages can be shown as a rich result in a rich result list, or in a carousel of similar non-AMP pages. Rich results can include headlines and images. Although Google can try to extract enough information from your page automatically to qualify for these features, if you include structured data on the page it can help Google better understand your page content and increase the likelihood of a rich or carousel result. Add a structured data element to your page, describing the article or video on the page. Read the guidelines to ensure that Google can crawl your page. Google recommends creating an AMP version of your page to provide a better user experience on mobile devices. Read more about the benefits of AMP on mobile devices. You must follow these guidelines to enable structured data to be eligible for inclusion in Google Search results. Warning: If your site violates one or more of these guidelines, then Google may take manual action against it. Once you have remedied the problem, you can submit your site for reconsideration. If you offer subscription-based access to your website content, or if users must register for access, you should add structured data for subscription and paywalled content. For multi-part content, proper pagination markup using rel=next and rel=prev can help our algorithms correctly identify the extent of those articles. In addition, it's important that canonicalization is done correctly, with a rel=canonical pointing at either each individual page, or a "view-all" page (and not to page 1 of a multi-part series). Learn more about pagination and canonicalization. The following guidelines apply to logos for all AMP pages, including AMP stories. The file must be a raster file, such as .jpg, .png, or .gif. Don't use vector files, such as .svg or .eps. The graphic part of the logo should be legible on the background color. The following guidelines apply to logos used for general AMP pages, not AMP stories. There are different logo requirements for AMP stories. The logo must be a rectangle, not a square. The logo should fit in a 60x600px rectangle, and either be exactly 60px high (preferred), or exactly 600px wide. For example, 450x45px would not be acceptable, even though it fits within the 600x60px rectangle. Publishers should use only one logo per brand that is consistent across general AMP pages. Use full wordmark or full logo; not an icon. The text in word-based logos should be at most 48px tall and centered vertically within the 60px image height. Add additional space to pad the height to 60px. Logos with a solid background should include 6px minimum padding around the graphic. The following sections describe the properties requirements for Article and Video structured data. You must include the required properties for your content to be eligible for display as a rich result. You can also include the recommended properties to add more information about your content, which could provide a better user experience. Article objects must be based on one of the following schema.org types: Article, NewsArticle, BlogPosting. The following properties apply to AMP pages. The author of the article. The name of the author. The date and time the article was first published, in ISO 8601 format. The date shouldn't change over time. We recommend including the hour information in addition to the day in the timestamp. The value for dateModified should be more recent than the value for datePublished. The headline of the article. Headlines should not exceed 110 characters. For AMP stories, the headline should match the text in the first cover page in the AMP Story. The URL to an image that is representative of the article or AMP story. Due to format differences in search results, the following image guidelines only apply to general AMP pages, not AMP stories. AMP stories have different requirements for images. Only a marked-up image that directly belongs to the article should be specified. Images should be at least 1200 pixels wide. Images must be in .jpg, .png, or .gif format. For best results, provide multiple high-resolution images (minimum of 800,000 pixels when multiplying width and height) with the following aspect ratios: 16x9, 4x3, and 1x1. The publisher of the article. The logo of the publisher. See the AMP logo guidelines for details. The height of the logo, in pixels. The URL of the logo. The width of the logo, in pixels. The date and time the article was most recently modified, in ISO 8601 format. The canonical URL of the article page. Specify mainEntityOfPage when the article is the primary topic of the article page. The following properties apply to non-AMP pages. Add the dateModified property if you want to provide more accurate date information to Google. The Structured Data Testing Tool doesn't show a warning for this property, as it's only recommended if you decide that it's applicable to your site. Add the datePublished if you want to provide more accurate date information to Google. The Structured Data Testing Tool doesn't show a warning for this property, as it's only recommended if you decide that it's applicable to your site. The headline of the article. Headlines should not exceed 110 characters. The URL to an image that is representative of the article. Only a marked-up image that directly belongs to the article should be specified. Images should be at least 696 pixels wide. For best results, provide multiple high-resolution images (minimum of 300,000 pixels when multiplying width and height) with the following aspect ratios: 16x9, 4x3, and 1x1. Video objects must be based on the schema.org type VideoObject. The description of the video. The title of the video. The logo of the publisher. For AMP specific guidance, see AMP Logo Guidelines. A URL pointing to the video thumbnail image file. We recommend that you provide a URL to your video. You can provide a URL by using one or both of the following properties: contentUrl and embedUrl. Make sure to follow our Video best practices. Tip: You can ensure that only Googlebot accesses your content by using a reverse DNS lookup. The duration of the video in ISO 8601 format. A URL pointing to a player for the specific video. Usually this is the information in the src element of an <embed> tag. If applicable, the date after which the video will no longer be available, in ISO 8601 format. Don't supply this information if your video does not expire. The number of times the video has been viewed.